Welcome to the Mankato Pride of Super 8, conveniently located off of Highway 169 and Junction 14, in beautiful Southern MN. Highway 169 runs parallel with the scenic Minnesota River, so driving to our facility is a treat all its own, especially during leaf peaking season. Our well appointed guest rooms have exactly what the traveler is looking for, including Business Center, free High Speed Internet, hairdryer, room service and coffee makers. 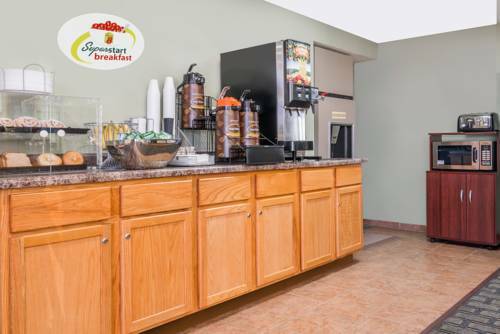 Each room includes our traditional SuperStart breakfast served fresh daily. Refrigerator/Microwave available upon request-very limited quantity. Late Summer brings NFL fans. Mankato home to the Minnesota Vikings Summer training facility. The city comes alive with many activities surrounding the late Summer event. Come and experience the thrill of hard-hitting action. Because we are centrally located, you will feel right at home, whether traveling on business or pleasure. Treat yourself at one of our many nearby shopping facilities. Sorry, no pets allowed. Come and see all of what Mankato has to offer. We look forward to seeing you. -We Will See You Along the Way-. In addition to its historical import, the bank is rumored to have the ear of one of the robbers stapled to a piece of cardboard in its basement. The late Francis Johnson's famous giant ball, now the centerpiece of the town. It's the "Largest Ball of Twine Rolled by One Man."